alaTest on kerännyt ja analysoinut 14 arvostelut lehdistä ja verkkosivustoilta. The first Chrome OS tablet promises much but doesn't deliver. Better Chromebook and Android tablet options are already out there. An underwhelming student-centric tablet that doesn’t meet expectations. As the world's first Chrome-powered tablet, the Acer Chromebook Tab 10 offers Google Expeditions support and other intriguing features for elementary school students, but its full potential hinges on some future updates. Supports IT remote-management features and Google Expeditions. Durable. Comes with integrated stylus. Sluggish. Using Chrome OS without a keyboard presents some problems. AR functionality is not yet ready. Bottom Line: As the world's first Chrome-powered tablet, the Acer Chromebook Tab 10 offers Google Expeditions support and other intriguing features for elementary school students, but its full potential hinges on some future updates. The 9.7-inch tablet is the world's first for the education market to run Chrome OS. And likely won't be the last. Normally this is where I’d talk about whether this is a tablet you should buy. But if you’re not an educator, Acer isn’t really trying to get you to buy this tablet. Acer made a capable tablet, but Google still has to work out kinks in Chrome OS. Simple yet functional design. ; Included Wacom stylus requires no pairing or charging. ; USB-C 3.1 Gen 1 port supports charging, data transfer, and external displays. ; Android apps that have been optimized for Chrome work quite well. Doesn't come with a Bluetooth keyboard. ; No real-time handwriting-to-text translation in text boxes. ; Some Android apps still have sizing/orientation issues on large-screened Chrome OS devices. The is the first tablet tablet to ship with Chrome OS… but it's easy to think of this as an Android tablet that just happens to be able to run the desktop version of Google's chrome web browser. 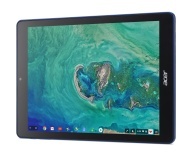 I’d like to see Acer target the consumer market with a similar device… but I suspect we’ll have to see how the tablet is received in the education space before the company decides whether to do that. Acer ha annunciato il Chromebook Tab 10, un tablet da 9,7 pollici ideato per l'ambiente scolastico.